Jodi Dellaventura’s set gets the nostalgia going even before the house lights go down. Large photos from Summer Shorts past — some from shows, others of casts smiling for the camera — capture some of the finest moments in the company’s history. But the plays, of course, are the thing. All the design touches, videos and messages wouldn’t matter, of course, if the plays weren’t strong — but they are, to different degrees. The nine in the anniversary edition are varied, smart, staged well and wonderfully acted. From raucous comedies to thought-provoking short dramas, each play is really a play, not a sketch. Short-form theater is the festival’s bread and butter, and this year City Theatre is mostly serving up gourmet fare. France-Luce Benson’s Risen from the Dough, which won City Theatre’s national award for short playwriting, gives Stephens the opportunity to create a rich portrait of a Haitian-American widow — grieving, stubborn, suspicious — as she and her youner sister (Hart) await the return of a health inspector to their bakery. Directed by the Haitian-American Sylvain, the play draws audiences into a world in which death doesn’t mean the end of the conversation. Younger’s Mandate is one of the festival’s gems. Directed by Manzelli, the play features Uribe as Drew and Sylvain as Marc, guys whose wives think their spouses could become pals. Uribe does good work in each of his plays, but he’s stellar in Mandate as a young dad in an otherwise all-female household. The program ends with Steve Yockey’s Mrs. Evelyn Foxy & Her Low Orbit Anxiety, a commissioned play directed by Tei. Just odd initially, as middle-aged housewife Evelyn (Dimon) has a guy (Sylvain) who was going door-to-door taking a survey about spotted owls trapped in her living room, the play turns delightfully nutty as Evelyn’s disapproving grown daughter Barbara (Hart) shows up unexpectedly, followed by Billy (Uribe), a hunky jogger Barbara used to babysit back in the day. The plot twists are off the wall, the actors hilarious. It’s a perfect Summer Shorts play in an impressive anniversary edition. Although the evening encompasses the work of multiple playwrights, four directors and a repertory cast of six chameleons, the evening has a unified tone of warmth and polish... continuing an upward trend during Producing Artistic Director John Manzelli’s leadership, this unusually consistent production scores as arguably the best written, produced and acted entry in the festival’s 20-year run. Some of the fine acting obviously is due to the direction of some of the best hands in the region including Manzelli, Margaret M. Ledford, Paul Tei and, for the first time here, Sylvain. The plays may be 10 or 15 minutes long, but no one scrimps on the production values, especially the lighting by Preston Bircher, peerless sound by Matt Corey, character-revealing costumes by Ellis Tillman, nimble set design by Jodi Dellaventura, even the props by Florencia Ancewicz. 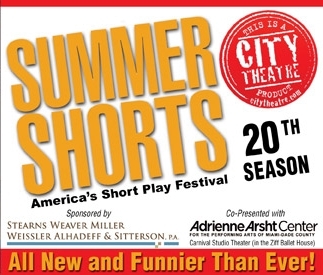 Summer Shorts 2015 achieves an enviable synergy of witty, probing plays, a perfect cast, and well-chosen directors, all of it swimming in two decades of nostalgia... this year's selection of nine world and regional premieres is the company's strongest in recent memory. It's a thoughtfully curated collection of plays complete with overlapping themes. Nearly every work in this valentine to the audience contemplates love's splendors and splinters, from the initial pangs of budding relationships to regret-soaked encounters between former companions. A great example is Kelly Younger's award-nominated Mandate. Two straight fathers — Michael Uribe's Drew and Bechir Sylvain's Marc — meet for a guys' night out that promptly gets real. Clad in a hilarious yellow-sleeved My Little Pony T-shirt, Drew reveals that, as a father of young daughters, he's become friendless and feminized. As Drew's emotional floodgates open, it prompts Marc to express his own anxieties. Bolstered by the actors' magnetic chemistry and Manzelli's tonally perfect direction, a story that could have lapsed into familiar gay-panic discomfort becomes an absorbing story of unlikely connection, a bromantic comedy in microcosm. Another indisputable highlight is Edith Freni's Flare... Dimon's paranoid gabber begins as a caricature and becomes real as motivations become clear that are both eccentric and touching. Her work in this short and others is a mini-master class in understanding character psychology; in ten minutes, she pinpoints the subtle gradations in mood and gesture necessary to create a character's worldview. Saving the most outrageous for last, Summer Shorts ends each of its two acts with deviant dispatches from the wilds of imagination. With its family-room set, Steve Yockey's world premiere Mrs. Evelyn Foxy and Her Low Orbit Anxiety is staged by Tei like a demented sitcom. Dimon is a kooky shut-in with a fear of falling satellites. Hart is her long-suffering daughter. And Sylvain is a door-to-door environmental activist who picked the wrong house on the wrong morning. Uribe appears later for an uproarious revelation. But nothing is more brilliantly bonkers than R. Eric Thomas' Silicon Valley satire Human Resources, with Wahl as a startup drone frustrated by the new hires his company installed in a merger — all of whom happen to be puppets, operated Avenue Q-style by Stevens, Sylvain, Uribe, and the Summer Shorts interns. The piece itself could be funnier, but Manzelli's direction is a choreographic clown car in the best way possible, with puppets and monsters and sound bites and visual gags spilling out of every filing cabinet, desk drawer, and cubicle. For the first time in many years, Summer Shorts leaves you wanting more. City Theatre presents Summer Shorts 20 at the Arsht Center through June 28, 2015.